Something for everyone! Perfect way to enjoy real Crete! 6 Nov 2015. Myself 44 and very unfit and six year old daughter booked to go on a tour. It was a remarkable experience and we thoroughly enjoyed it! 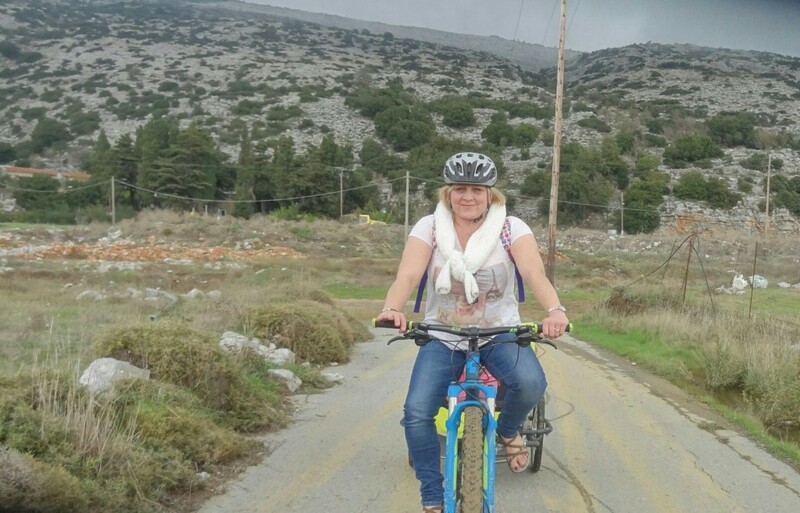 Stelios is clearly passionate about cycling and the outdoors and can offer everything from gentle leisure rides mostly off road and flat to challenging extremes that would suit the more athletic builds and many other tours in between! My daughter was too small for the smallest bicycle so Stellios, our tour guide organised a trailer for her. He even helped us up a hill whilst still cycling! Stelios speaks and writes excellent English and went out of his way to ensure both myself and daughter got the best out if our visit. He frequently helped unprompted to assist with my daughter when she needed attention. Our trip included breathtaking scenery, mountain goats, frequent stops to enjoy the area, look at plants and smell them, learn about what they are and how they are used. My daughter was thrilled that Stelios found us a baby pumpkin at the edge of a random field as it was Halloween! She also enjoyed feeding the donkey a fresh apple and tasting them straight from the tree for ourselves! Stelios was kind enough to wait for us whilst we visited Cave of Zeus where we were thrilled to get a donkey ride up to the entrance. Stelios is very knowledgeable about the area and is a gentle natured, relaxed, inoffensive chap who simply wants to share his love of cycling and the outdoors with you. Stelios shows be is eager to ensure his guests have the best time to suit their requirements. We found Stelios to be very polite, friendly and sensitive to our needs and experiences. I would definitely recommend a visit and Stelios can answer any questions you may have if you wish to make contact prior to or during your visit. It was well worth the money and we will definitely go again next time we are in the area! It was a genuine pleasure to take the bicycle tour and to enjoy Crete and meet Stelios and his wife along with their friend. We wish Stelios and his family every success as they continue to expand their growing business! It was no surprise to see it had a remarkable reputation earned by the care and the personal attentiveness Stelios provides for his tour guests and his services.